Product prices and availability are accurate as of 2019-04-14 21:10:36 UTC and are subject to change. Any price and availability information displayed on http://www.amazon.com/ at the time of purchase will apply to the purchase of this product. The Schrader old Timer Copperhead gut hook liner lock Folder features a 3.44" Drop point blade made from 7Cr17MoV high carbon stainless steel. The handles are snake skin textured rubber with jumped thumb ramp and lanyard hole. Comes with a molded nylon belt sheath. Founded by Stewart Taylor in 1975, Taylor Brands has been manufacturing, designing and distributing high-quality stainless steel knives and accessories since its inception. Taylor Brands manufactures Schrader Cutlery such as Old Timer, Uncle Henry, Schrader Tuff, and X-timer. They have recently introduced a high quality line of Schrader flashlight, scissors, and shears. 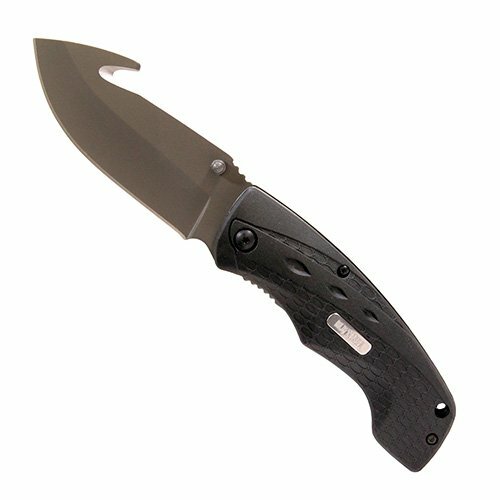 Taylor Brands also manufactures Smith & Wesson Cutlery such as S.W.A.T., Extreme Ops, Homeland Security, Search & rescue, and H.R.T. Taylor Brands is also renowned for their specialty items and custom designed pieces such as the Texas Ranger commemorative knives celebrating the 180th Anniversary of Texas Rangers. Outdoor enthusiasts, hunters and, most recently, law enforcement and fire safety professionals utilize Taylor Brands products. 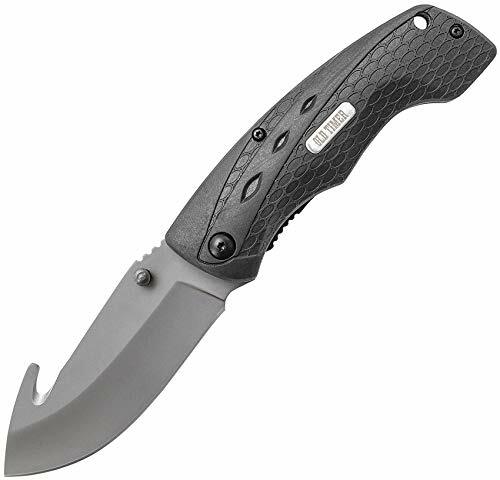 Includes: - Lanyard Hole - molded polyester sheath Specifications: - type: folder - blade type: gut hook - edge type: Plain (straight) - blade material: 7Cr17MoV High carbon stainless steel - handle material: rubber - blade length: 3.42" - handle length: 4.53" - overall length: 7.84" - weight: 0.31 lb.